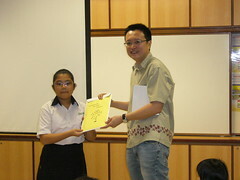 I’ve filed a report on the Maximize Your Potential (MYP) Ceremony held on 21st Aug 2010. From the report, you’d see that 2 inaugural MYP award winners (there were 7 in 2004) came back to speak to this year’s award recipients. You’d also be pleased to learn that MYP has supported 53 students since its inception. I’ve registered a new website to host Run For Funds (RFF) info. Please click on www.icareandshare.com to view the full report and pictures taken during the event. For those of you who have been asking, my back problem is sorted. Am now training for my 7th full marathon on 5th Dec 2010. Closer to the date of the run, I will be sending out an appeal to raise funds. Reason: With the release of $21,750 to Geylang Methodist School (Primary) to run the MYP program for another 3 years, there is $6,956.23 (as of 10/10/2010) left in the RFF fund. 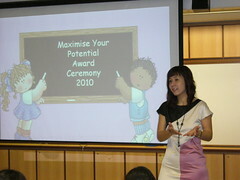 The 7th Maximize Your Potential (MYP) ceremony was held on Saturday 21st Aug 2010. 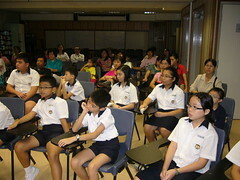 The event was graced by Geylang Methodist School (Primary) GMSP Principal Mrs. Rina Yap and Vice-Principal Mrs. Molly Soong. 19 MYP recipients ( seven Primary 4, six Primary 5, six Primary 6 students) and their parents started filling up the venue at 0930h. The event started promptly at 1000h with introductions from Mrs Jessie Soh (who has been instrumental in the success of the program since its inception in 2004) and an opening prayer by school Chaplin Reverend Nga Mee Hee. 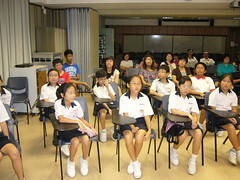 Next, Mrs Yap addressed the students. She congratulated them on being selected for the award that was based on academic results, CCA participation as well as exemplary behaviour in school. She encouraged them to keep up their good work. To help their children develop their potential by exposing them to developmental activities that would otherwise be financially out of reach. He also shared that RFF will be sponsoring a further $21,750 to run the MYP program at GMSP for another 3 years. This year, we managed to get 2 of the first batch of MYP recipients (in 2004) to speak to the students. 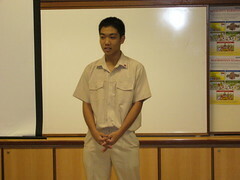 Alfie Lim is a JC 1 student at Nanyang Junior College. He told the students that each family faces different difficulties and challenges. They cannot change this reality. He urged them not to be discouraged by their immediate circumstances and continue to work hard and don't give up. He encouraged them to continually seek knowledge and improve themselves. Tan Zhi Wei is now in secondary 4 in Hwa Chong's integrated program. He shared how the MYP award helped him pursue his interest in art. 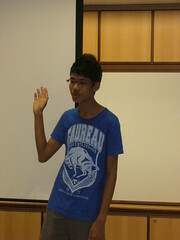 He also shared how he developed interest in software programming although it is not part of school syllabus. Like Alfie, Zhiwei encouraged the students to make full use of their time to try new things and discover latent potential which may be useful later in life. The awards were handed out to the 19 deserving students. 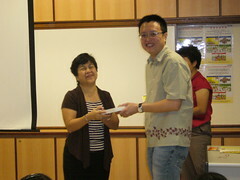 Below are pictures of Mrs. Yap (left pic) and Rev Nga presenting awards. 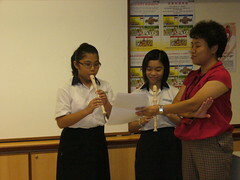 Then Teng Jee Hui and Joyce Chim entertained all participants an instrumental piece (recorder). 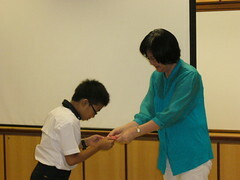 Mrs. Soong presented Adrian with a token of appreciation and Teng Jee Hui presented "thank you cards" prepared by MYP recipients to RFF supporters. The ceremony ended with a group photo session followed by light snacks for all involved. I'd like to thank GMPS for their continued support of the MYP program. Special thanks to Mrs. Jessie Soh and Miss Theresa Tong for 7 years of dedication to the MYP program. just wondering.... was this mrs molly soong the former vice principal of nan chiau pr sch? I believe the answer is yes. They are the same person.